3D Modeling Programs allow to create things that don’t exist in real world yet. A 3D Artist who wants to succeed in it requires skill, but, most importantly, tools – the right software. But, as with anything these days, there is too much of it out there! 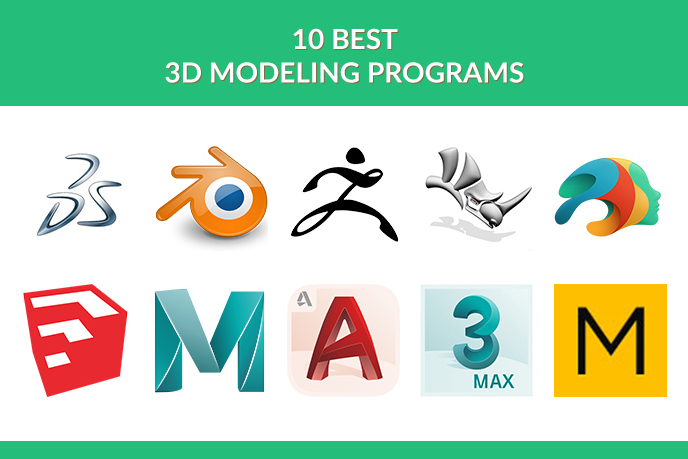 You need to keep up, so if you’re lost in the sea of possibilities, we present you 10 Best 3D Modeling Programs! The grandfather of 3D Modeling Programs is alive and kicking, having the largest selection of advanced tools and capable of being used via gadgets or cloud services. Despite being very hard to master, it can provide satisfying results for both creative people and industries. And a thriving user community will provide help if needed. An old Design software by modern standards, but SketchUp still holds up pretty well. It is primarily used by Architects, but has uses in Modeling as well. It helps a 3D Artist sketch (hence the name) ideas and see how they fit different projects. A versatile choice! Marvelous Designer is the best tool for creating photorealistic fabric, fur and leather textures and meshes. CGI clothing made in this Program can be seen in blockbuster movies and AAA video games. Obviously important for Furniture Design and Product Modeling, but due to limited use this is as far as it gets in our list. One of the more powerful 3D Modeling Programs for Mac and PC alike – morphing, posing, texturing, rendering and animating all in one neat package. Oh, it’s also free and you can keep all your work without any royalties. Give it a shot! Complete opposite to SketchUp – that’s AutoDesk Maya in a nutshell. It is used by the likes of Pixar and Bungie to craft incredibly detailed and alive virtual worlds. It possesses the most robust set of tools of all 3D Modeling Programs, incorporating physics-based environmental systems to create insanely realistic scenes. It would be number 2, but its complexity is as high as its possibilities! Rhinoceros 3D is a very versatile Program, fit for product design, CAD, CAM, 3D printing, multimedia and graphic design. Its geometry is mathematically precise and excels at curves and freeform surfaces. A perfect tool for mechanical design, but still useful for 3D Modeling. We hope you don’t mind slower workflow and a lot of numbers. Blender is a professional free open-source Program used mainly for creating animated films, visual effects, apps and video games. It has a great array of features such as texturing, UV unwrapping, raster graphics editing, rigging, skinning, sculpting and simulating various effects. This impressive toolset comes with a steep learning curve though, so brace yourself. Blender is a jack of all trades and will serve you well for any creative task! According to Dassault Systèmes, it’s publisher, over 2 million engineers and designers at more than 165,000 companies used SolidWorks as of 2013. And for a solid (pun intended) reason. This Program was designed to work in broad spectre of industries – industrial design, mechanical engineering, automotive, shipbuilding, industrial equipment, architecture as well as the medical and energy sector. It gets only third place in our list though – it’s complicated and requires engineering expertise. One of classic multi-purpose Programs used by 3D Artists, game designers and Architectural Visualization Studios. This beast can be used to create all kinds of special effects, with extensive particle, light and cloth simulation capabilities. It also can create parametric and organic objects even from cloud data and model precise meshes. Requires a lot of time to master, but offers a lot of 3D Modeling Opportunities! ZBrush offers a new way of 3D Modeling. Instead of combining meshes, it allows the user to sculpt them like clay. This gets rid of polygon stretching and gives the user an ability to do detailing progressively. You don’t create a high resolution mesh at once, but build it up from silhouette to fine little details. While its direct competitor, Autodesk Mudbox, relies on other Programs like Maya to create base geometry, ZBrush is completely self-sufficient. If you want to explore 3D Sculpting and not afraid of steep learning curve, this is your choice! It is also worth mentioning that with the advent of VR and AR, 3D Modeling companies create their products in compatibility with game engines like Unreal Engine (https://www.unrealengine.com/en-US/what-is-unreal-engine-4) and Unity (https://unity3d.com/) to create fully interactive scenes and renders later. We hope this list was helpful. If you have any questions about these and other Programs, feel free to contact us. We provide professional 3D Modeling Services for all your Design needs!